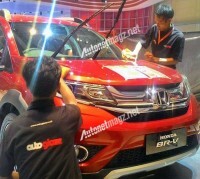 Honda is planning to launching BR-V, a Brio based 7 seater SUV in the Indian market by end of the year. The car will be launched at the 2015 GIIAS (Gaikindo Indonesia International Auto Show) today(20thAugust). BR-V stands for bold recreational vehicle. The leaked images show the SUV being cleaned thoroughly to ensure it is spotless during the launch. The SUV has been developed for developing markets. The car has similarities with the CR-V in terms of design philosophy. The grill looks distinctive with just one single thick chrome slat featuring the Honda logo. The fog lamps have got chrome housing and a wide air dam at the front.The side looks just like the Brio which has not been tinkered with at all. The vent window behind C-pillar resembles the curves on the CR-V. The ground clearance has also been increased significantly to give it a more ‘SUVish’ feel. The BR-V is expected to share its engines and transmissions with the Mobilio MPV. 1.5 liter i-VTEC petrol and i-DTEC turbo diesel engines could be offered, with manual and CVT automatic transmissions. It will come with a front wheel drive layout in all probability. Considering that the Mobilio has fared poorly in the Indian market this would be a timely boost for Honda in the 8-12 lakh SUV category. The SUV segment has seen continuous stream of launches. Suzuki S-Cross, Hyundai Creta, Renault Duster,the upcoming Mahindra TUV3OO would make it all the more difficult for Honda BR-V to carve a space in this market. Pricing would do the trick in this case which could only be achieved with a significant amount of localization. The BR-V would debut at the Delhi Auto Expo in January 2016, which would give us a fair idea if Honda have a winner on hands or have they missed the plot?